Could anyone please name the men in this photograph? or connect me to other photographs of the 175th tunnelling company? My relative was Lance Corporal Ralph Davis Reg No. 102341 of the 175th Tunnelling Co. and I have no photographs of him, he was killed on Flanders Fields and it would be wonderful to see his face. I have emailed you with details. It would appear from the war diary of 175TC that your relative was one of three men killed that day whilst in the open above ground. There are plenty more details on my email as well as a link to his extant service record. 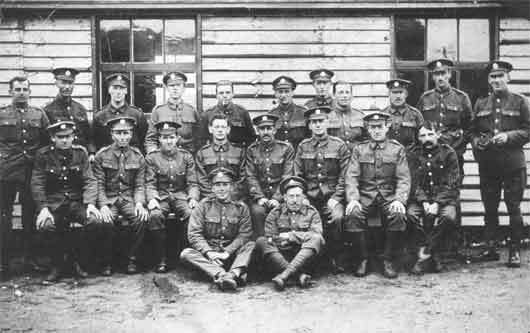 My relative Thomas Fulham Wales was in the 175th Tunnelling Co, would he be on the photo by any chance, as I don’t have any photos’ ? Transferred to 175 Tunneling Regiment 19/07/1915 due to his work as a miner. Sorry Brad, I do not have details of the personnel on the photo so cannot say for sure. I believe that Sapper 102341 R. Davis was awarded a medal for Distinguished Conduct in the Field in early December 1915. I have his medal without the ribbon, have you found anything else about him and the circumstances of the award? My great uncle was in the 175th Tom Thompson… died early 1916 from wounds sustained july 1915 at Hooge. I have a photo of him with his wife and children …… I would like to know if poss who these guys are ? Tom was a miner from the Potteries and may have joined with others from his area. My research and thanks to JB have found out so much but would like to know more as at this time so much seems to be coming to light. I too wonder whether my great grandfather William McClennon is one of the faces in the photograph of a section of the 175th ? Hi Siobhan, it’s possible we’re related then as I’m pretty sure William McClennon was my great grandfather too!